A trader works in the silver and gold options pit on the floor of the New York Mercantile Exchange in New York, April 25, 2011. 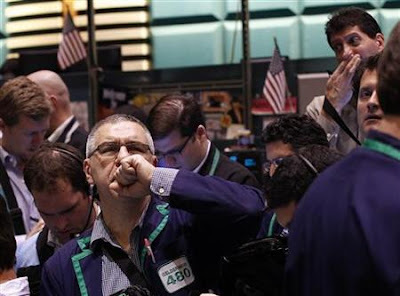 NEW YORK/CHICAGO (Reuters) - Big hedge funds and speculators cut their bullish bets on commodity markets by $17 billion in the week through Tuesday, the biggest bear turn since at least 2009, regulatory data showed on Friday. The so-called "managed money" funds cut their overall net long holdings in 22 U.S. futures markets by over 222,000 contracts or 13 percent in the five days ended May 10, according to Reuters calculations based on the Commodity Futures Trading Commission's weekly Commitment of Traders. The data, based on both futures and options positions, confirm that some big hedge funds, commodity trading advisors (CTAs) and other major speculators dramatically pared back long positions during a week in which prices abruptly collapsed before staging a modest rebound. But it also shows that in some markets, such as oil, the story was more complicated. The one-week cut in holdings was the largest since 2010, when available data begins. Total fund length still stood at its highest since mid-March at 1.5 million contracts. "I would view this as a bearish situation. We have a confirmed flow of selling with substantial remaining net long positions that can fuel an ongoing flow of that selling," said Tim Evans, energy analyst at Citi Futures Perspective. The value of total fund holdings fell to $116.8 billion, less than a third of the total amount of investor capital estimated to be allocated to commodity markets worldwide. Some of that money is in over-the-counter contracts or invested via banks, which are part of a different CFTC group. Although it is an imperfect gauge, the CFTC data offers the best clues yet as to how traders positioned during the most volatile week in two years. Crude oil collapsed by $10 on May 5 in a rout that traders are still struggling to explain, taking commodities with them, but then rebounded Monday and Tuesday. The biggest decline in the value of net long positions occurred in the crude oil market, where prices dropped by about 6.5 percent. The New York Mercantile Exchange's U.S. crude oil futures and the IntercontinentalExchange's look-alike contract saw speculators' net long position drop by $6.5 billion. The notional figure is calculated by Reuters based on the change in the net position from a week ago, multiplied by the contract's value at the end of the period. Because most investors trade commodities on margin, the drop in the value of positions is not directly equivalent to total divestment. Bullish bets on oil fell to the lowest since late February, when traders were beginning to factor in more geopolitical risk from Middle East instability and war in Libya. But the drop occurred even as the total open interest -- the number of outstanding futures contracts that haven't been settled -- rose to a record, indicating that more traders were opening positions than were closing them during the week. While bullish speculators sold long positions actively during the week, bearish speculators also added new short positions, increasing the short interest to the highest since late February. The "swap dealers" category, generally big banks, covered some of their large net short position. Precious metals also saw heavy selling during the week, although this was more the result of pure long liquidation than traders taking up new short positions. Long holdings in COMEX gold fell by nearly 20,000 contracts or 10 percent on the week, a reduction equivalent to roughly $3 billion, the biggest drop since last November. Gold futures fell by about 1.5 percent that week. Net length in COMEX silver, whose deep sell-off from a record high began the previous week, fell by nearly a quarter with funds cutting their bullish holdings by $1.1 billion. Big hedge funds had actually begun paring positions weeks before prices reached an all-time high of nearly $50 an ounce. At about 19,000 contracts, speculative net length is at its second-lowest since early 2010. The Chicago corn saw similar positioning dominated by fund managers taking profits. Bullish funds cut their length by some $950 million to take positions to their lowest in six weeks, and near the lowest since the middle of last year. Prices fell by a more modest 1.8 percent. "They still have a sizable amount and if things don't go their way, there could be more liquidation to come," said grains analyst Mark Schultz at Northstar Commodity Investments Co. in Minneapolis.